You're on your morning commute to work. You're running a bit late. Traffic looks pretty heavy. You're grateful you own a top-of-the-range wormhole enabled corvette. You pull up to the wormhole station in Omicron Persei. But wait? Why is the station being dismantled? What did that billboard just say about wormhole FTL engines not being legal anymore? It sounds like you might have forgotten about Hyperlane Switch Day. It's been an entire galactic cycle in development, cost 150 trillion energy credits to implement, is expected to cause interstellar travel chaos - and comes in to effect later today. Feeling unprepared? Don't fret. Xenonion Answers: Everything you need to know about Hyperlane Switch Day. As per the Galactic UN's Apocalypse Act, hyperlanes will now be the universal type of FTL travel for the galaxy, with basic warp drive and artificial wormhole technologies being banned. The switch is seen as a more permanent solution to the galaxy's transport woes of clogged hyperlanes, overused wormhole stations and warp-drive induced galactic warming. It is hoped that by redirecting existing infrastructure funds exclusively to hyperlanes, the network can be expanded. Hyperlanes were selected as they offer speedy point-to-point access, energy-free maintenance and natural chokeholds - giving the perfect locations to build space-tolls. 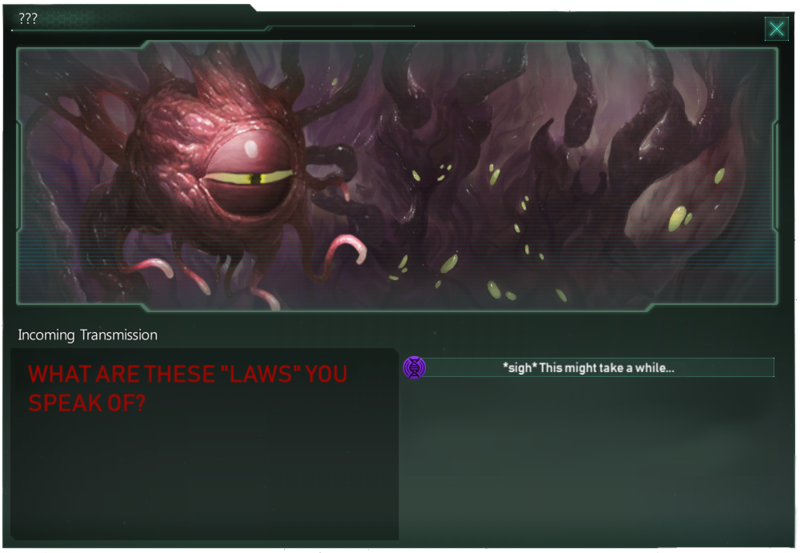 Psychic diplomats are currently trying to convey the new legislation to the Prethoryn Scourge to avoid accidental acts of criminal space travel. Image: Communicating the GUN’s demands is rarely easy. As part of the FTL rework, hyperlanes can now only be accessed at specific entry and exit points within systems. This means no more accessing hyperlanes from anywhere within a system when in transit - if your ship is not at a hyperlane gate, you'll need to travel at sub-light speed to get to it. This means a longer commute, but you're doing your bit for the galaxy as there's absolutely no way of getting around those space tolls. Mature space empires will still be able to fit ships with conventional or psionic jump drives, but will need to pay special taxes to the Galactic Department of Licensing for Conveyance (DLC). Otherwise they could just jump right over those space tolls. Newer jump drives also impact on the overall efficiency of a ship, requiring a longer recovery time after use - so try not to jump into unfriendly territory. In a bid to encourage public transport use, the Galactic UN has repaired parts of the ancient Gateway Network for empires to use at a discounted rate. These mammoth relay nodes, believed to have been constructed by an ancient precusor race, effectively allow for hyperlane transport but over huge distances. All outlying relays converge directly on the Galactic UN Citadel-space station, and definitely weren't built to facilitate the end of the cycle. We have dismissed these claims. With more traffic using the hyperlane network, it's likely more ships will be affected by environmental factors. Expect gridlock around black hole systems as gravity wells will slow down sub-light travel, and watch for hull scratches near neutron stars as they're known to interfere with shields. You can keep up to date with this through Xenonion SpaceWeather. As all space-nations shift to hyperlane use, the galactic map will be redrawn. The Schedi Nebula will stay where it is, but just be aware it may now be controlled by some ravenous Hive Mind rather than those cute xenophilic felines. Instead of border pressure via colonisation or random frontier outpost construction, each individual system that a space-nation wishes to hold will now have to build a starbase directly in it. These new generation of frontier outposts can be upgraded to military or economic starholds, which inevitably means while you're queuing to use that new space toll you can get a drive-thru TacoBell. Your map UI is also in for an update - the Galactic UN hired the Artisan Troupe Liberal Arts Space Station to develop a more aesthetic representation of empire borders, and the results look pretty pleasing to the eye. It's now much easier to get to a destination, being able to distinguish one amorphous blue blob empire from another. Image: The Artisan Troupe have developed a more aesthetic representation of empire borders. For the novice admirals among us, don't forget part of the Apocalypse Act includes banning the practice of space-nations merging all their fleets into so-called 'doomstacks'. Inspired by the Prosperous Independent Leader's Ensemble Faction (PILES) movement, the Galactic UN has recognised that an admiral's ability to efficiently command a fleet may perhaps be in direct proportion to the size of said fleet. Empires are advised to split their fleets into several smaller fleets under the command of multiple admirals. Don't worry, two-corvette households won't be affected. Henceforth only qualified personnel will be allowed to venture into unexplored space. Scientists have long since complained about so called “corvette scouting”, wherein military vessels probe unexplored systems to reveal any potential threats before manned science ships are sent there. Top scientists have long argued that corvette scouting takes away much of the excitement from their jobs, as they rarely are faced with any lethal hazards. Security analysts warn that the imposition of hyperlanes may cause a spike in crime. Traditional warp drive and wormhole technologies are expected to flood underground black markets like the notorious Steam Workshop. With border changes coming into effect, it is expected many more systems will be left unclaimed, creating ideal breeding grounds for space pirates.